The drying of grapes into raisins has been practiced since ancient times. Raisins were produced in Persia and Egypt as early as 2,000 BC. Raisins are made from dehydrating grapes in a process that either involves the heat of the sun or a mechanical process of oven drying. Among the most popular types of raisins are Sultana, Malaga, Monukka, Zante Currant, Muscat and Thompson seedless. The size of small pebbles, raisins have wrinkled skins surrounding chewy flesh that tastes like a burst of sugary sweetness. While the colours of raisins vary, they are generally a deep brown colour, oftentimes with hints of a purple hue. Raisins are not often spotlighted for their outstanding nutritional benefits but they deliver some important nutrients such as boron which is a mineral that is necessary for women to help strengthen the bones. Raisins also provide benefits against macular degeneration. It’s as simple as adding a handful of raisins to your cereal at breakfast, in your yogurt at lunch time, or sprinkle them on your salads. You can also spice up rice or grain dishes with raisins. Did you know that raisins also promote healthy gums and teeth? Raisins, even though they are sweet and sticky do not cause cavities and gum disease, but actually promote oral health. If possible, purchase raisins that are sold in bulk or in transparent containers so that you check to see that they are moist and undamaged. When buying raisins in a sealed, opaque container, make sure that the container is tightly sealed and that they are produced or packaged by a reputable company. Storing raisins in the refrigerator in an airtight container or in single serving boxes will extend their freshness and prevent them from becoming dried out and can be kept for about 2 months. 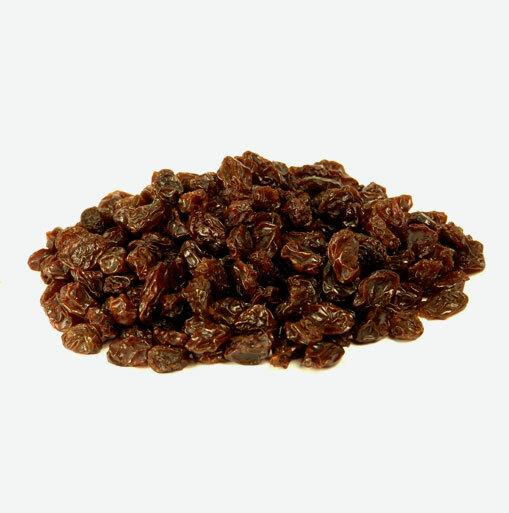 Like other dried fruits, raisins are available throughout the year. To restore dried out raisins before adding them to a recipe, place them in a bowl, covered, with a little hot water for a few minutes. You can use the nutrient-infused liquid in the recipe. Soak raisins and other dried fruits in water to soften for an easy-to-make compote that is so versatile it can be served a variety of ways. Some favourites include serving raisins on top of grilled chicken or layered with plain yogurt to make a dessert parfait. Raisins go well in most baked goods. Add them to bread, muffins and cookies. Add raisins, almonds, peppers and onions to brown rice to make a tasty side dish. Raisins’ sweetness and texture make them a great addition to poultry stuffing. Mix raisins with your favourite nuts for a high-energy, protein and fiber-packed homemade snack or trail mix.